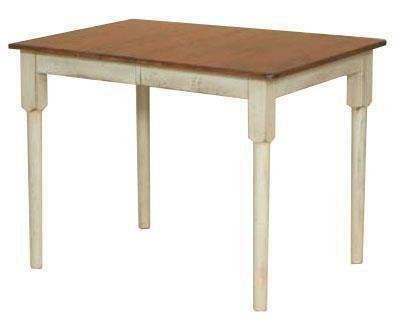 The Plymouth Pub Table features a distinct country feel with a heavily distressed parchment finish. The table top itself is a solid 1" thick, and is available in a number of quality hardwoods. The Plymouth Table is completely handcrafted, and made in America. The New England inspired Plymouth collection features gorgeous chairs with Windsor style influences to compliment this beautiful rustic table. The Plymouth table is available in a wide array of solid hardwoods and finishes to meet your home and needs. Call today to speak to an Amish furniture specialist at 1-866-272-6773 or visit us at our store.